Preheat the oven to 220C (200C fan assisted)/425F/Gas 7. Lightly grease a baking tray with butter and line it with baking or silicone paper (not greaseproof). Put 450g/15½oz of the flour into a large bowl and add the butter. Rub the flour and butter together with your fingers to create a breadcrumb-like mixture. Add the sugar, eggs and baking powder and use a wooden spoon to turn the mixture gently. Make sure you mix all the way down to the bottom and incorporate all of the ingredients. Now add half of the milk and keep turning the mixture gently with the spoon to combine. Then add the remaining milk a little at a time and bring everything together to form a very soft, wet dough. (You may not need to add all of the milk.) Sprinkle most of the remaining flour onto a clean work surface. Tip the soft dough out onto the work surface and sprinkle the rest of the flour on top. The mixture will be wet and sticky. Use your hands to fold the dough in half, then turn the dough 90 degrees and repeat. By folding and turning the mixture in this way (called 'chaffing'), you incorporate the last of the flour and add air. Do this a few times until you’ve formed a smooth dough. If the mixture becomes too sticky use some extra flour to coat the mixture or your hands to make it more manageable. Be careful not to overwork your dough. Next roll the dough out: sprinkle flour onto the work surface and the top of the dough, then use the rolling pin to roll up from the middle and then down from the middle. Turn the dough by 90 degrees and continue to roll until it’s about 2.5cm/1in thick. ‘Relax’ the dough slightly by lifting the edges and allowing the dough to drop back onto the work surface. Using a pastry cutter, stamp out rounds from the pastry and place them onto the baking tray. Dip the edge of the pastry cutter in flour to make it easier to cut out the scones without them sticking. Don’t twist the cutter – just press firmly, then lift it up and push the dough out. Once you’ve cut 4 or 5 rounds you can re-work and re-roll the dough to make it easier to cut out the remaining rounds. Any leftover dough can be worked and rolled again, but the resulting scones won’t be as fluffy. Place the scones on the baking tray and leave them to rest for a few minutes to let the baking powder work. Then use a pastry brush (or your finger if you don’t have a brush) to glaze them with the beaten egg and salt mixture. Be careful to keep the glaze on the top of the scones. (If it runs down the sides it will stop them rising evenly.) Bake the scones in the middle of the oven for 15 minutes, or until the scones are risen and golden-brown. 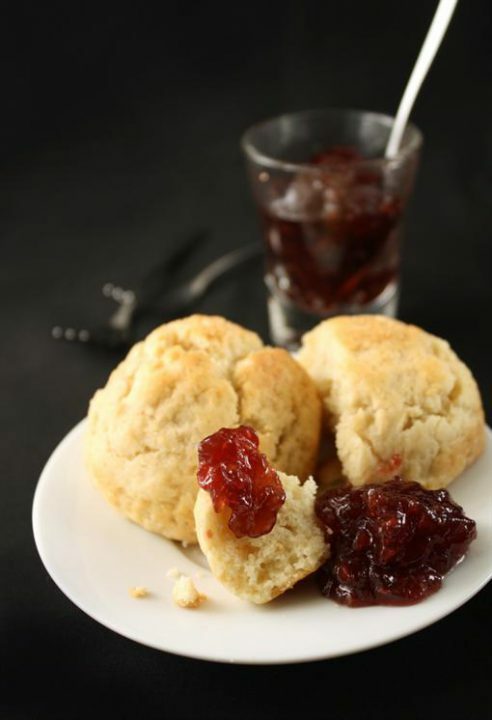 Leave the scones to cool, then split in half and add butter, jam and clotted cream to serve.